1. Are you a Parrothead? Of course you are! The EIPHC will support you by a $10 donation when you walk during our sunrise to sunset relay. On Saturday, June 17 you will be scheduled to walk a 2 mile leg of the relay depending on the time of day you want to walk and where you live. As we have done in past years we will have volunteers who can shuttle you from the end of your walk back to your car (EI police allows street parking with our special passes for the day). We find that walking with a larger group brings greater attention to the event. Please invite your family and friends to walk with you. Let us know you will be joining us and we will be in touch with you closer to the walk to let you know the schedule. 2. Fundraise/Donate: Go to https://act.alz.org/goto/EISTC2017 (you may have to copy and paste into your browser if you cannot click on the link). Click on Join our Parrot Head Team and search for Emerald Isle Parrot Head Club (Val Johnson can assist you). There you can donate to the EIPHC team directly. 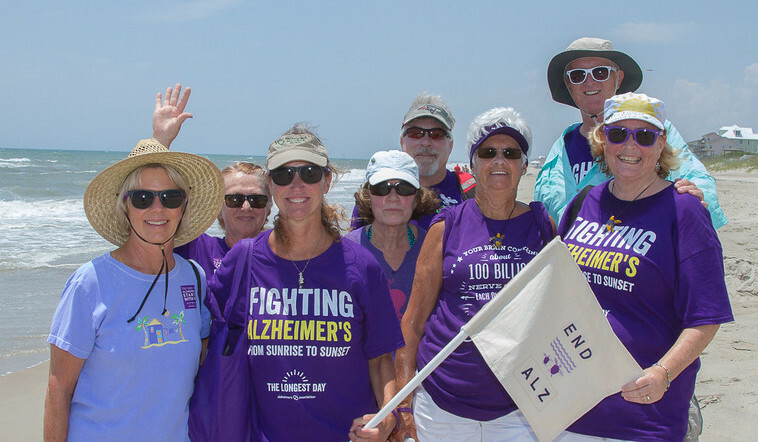 If you want to create your own page for family and friends to donate, when you go to https://act.alz.org/goto/EISTC2017 click on Register. Registration is free. When you register you have the option of purchasing a t-shirt for $5 or $10. When you register you can personalize your own page on the website with your story about living or caring with someone with Alzheimer’s. You can invite friends and family to donate to your page, walk with you or attend one of our fundraisers. And of course we will take cash or check direct donations to the team! BONUS: Any donation of $50 or more will enter the person in the raffle for a stay at Batten the Breeze (courtesy of Emerald Isle Realty)! 3. Attend a Fundraiser: Frosted in Swansboro is holding a Cake Decorating Fundraiser for us on April 25 or May 18 from 7:30-9pm. The cost if $53.50 (tax included) and $15 of each fee will be donated to our team! We are also holding a weekday event on Saturday, May 27 from 5:30-7pm. We can also schedule a painting class with Peggy Poe if anyone would like to paint a swimming Sea Turtle. We can schedule small groups if you have friends or family who want to do the event together. Let me know if you are interested in attending so we can register for the event. These events are open to everyone (not just EI Sea Turtle Patrol).